MacroPro™ is a delicious, scientific blend of the highest-quality macronutrients designed to nutritionally sustain the body at optimal levels. All three major macronutrient categories are represented in MacroPro™. 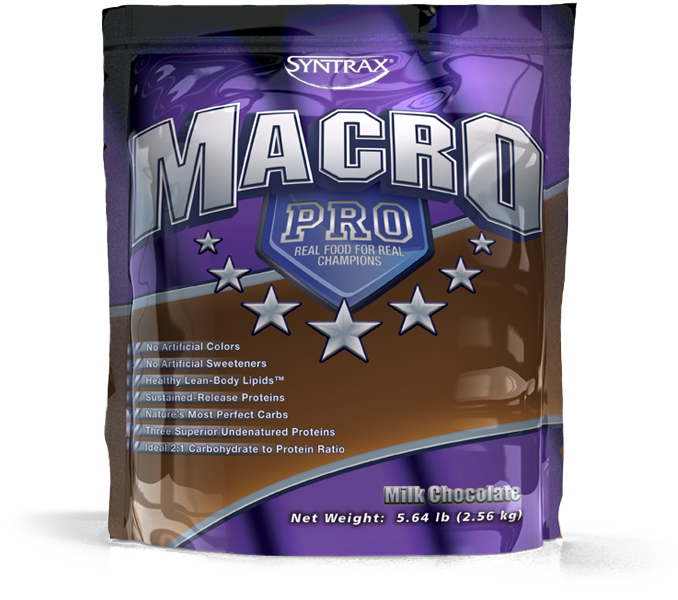 MacroPro™ contains ideal amounts of protein, carbohydrates (including fiber) and fat. MacroPro™ is a healthy beverage powder that may be used by anyone interested in the very best nutrition in a convenient form. Due to its high caloric density, MacroPro™ is especially ideal for those interested in gaining weight or adding significant quantities of additional calories to their diet. Other nutritional or meal replacement powders are created with cheap, inferior ingredients, such as high-glycemic carbohydrates, fat-inducing lipids and denatured, bad-tasting proteins. On the other hand, MacroPro™ uses the highest-quality carbohydrates, fats and proteins that taste great while being healthy and nutritious. Most nutritional beverage powders use either partially hydrogenated vegetable oils or polyunsaturated-based vegetable oils as their fat sources. Although cheap and tasteless, these oils are neither the healthiest nor the best choice. In fact, partially hydrogenated oils contain an abundance of trans fats which have been linked to a host of negative health problems such as cardiovascular disease. Polyunsaturated fats, such as soy bean oil and corn oil, are better choices but are not ideal in regards to body fat accumulation and health promotion. Although more expensive, MacroPro™ contains medium-chain triglycerides (MCTs) and monounsaturated-based vegetable oil. MCTs are special fats that are resistant to being converted to adipose tissue. Instead, they are preferentially burned as a primary energy source similar to carbohydrates. MCTs are known as healthy lipids and are widely used in the medical industry to benefit many disease states. MacroPro™ also contains a lipid very similar to olive oil called high-oleic sunflower oil. Like olive oil, this special sunflower oil contains 80% monounsaturated oleic acid. Oleic acid not only keeps fat accumulation to a minimum but also promotes cardiovascular and whole-body health. Most nutritional beverages use either denatured, off-tasting whey protein or synthetic, denatured casein in the form of caseinate salts (sodium, potassium and calcium caseinate). Indeed, these proteins are cheaper, but they lack the organoleptic, functional and health-inducing benefits of their natural, undenatured counterparts. MacroPro™ is unique because it contains only the very best proteins that are in their native, undenatured forms. These proteins include undenatured whey protein concentrate, undenatured micellar casein and undenatured egg white protein. Being unaltered by chemicals or heat, these proteins have exceptional taste profiles and utmost health benefits. The result is a nutritional beverage powder that tastes great and produces noticeable, real-world health benefits. MacroPro™ is designed to provide the highest-quality macronutrients to a person’s diet without stimulating the unwanted accumulation of body fat. As long as MacroPro™ is included as part of total maintenance calories (calories sufficient to maintain current body weight), it is highly unlikely that any additional adipose tissue would be added. Actually, it would not be surprising for there to be a reduction in body fat from using MacroPro™. It must be stressed, though, that any program which includes additional calories for the purpose of gaining weight will inevitably cause at least marginal increases in body fat stores. Thankfully, MacroPro™ is designed to minimalize this increase in body fat to the lowest extent possible. MacroPro™ ideally may be consumed anytime throughout the day. Due to its macronutrient profile, MacroPro™ works as a convenient, healthy meal replacement or as an additional snack or meal to a person’s normal dietary regimen. No! MacroPro™ is sweetened only with natural, healthy ingredients. Notice that MacroPro™ is packaged in a high-quality laminated bag. There is considerable savings in packaging with this method, which consequently offsets the increased costs of the ingredients. Do not worry about freshness! The plastic laminate used for the bag of MacroPro™ is an oxygen and moisture barrier structure, which works as well as, or better than, the typical plastic jugs. Furthermore, it contains a recloseable zipper for convenience and uses less of the earth’s precious nonrenewable resources.